It’s been over a year since I contributed to my series on Self-Hosted WordPress Alternatives, and I reckoned that it’s about time to change that. 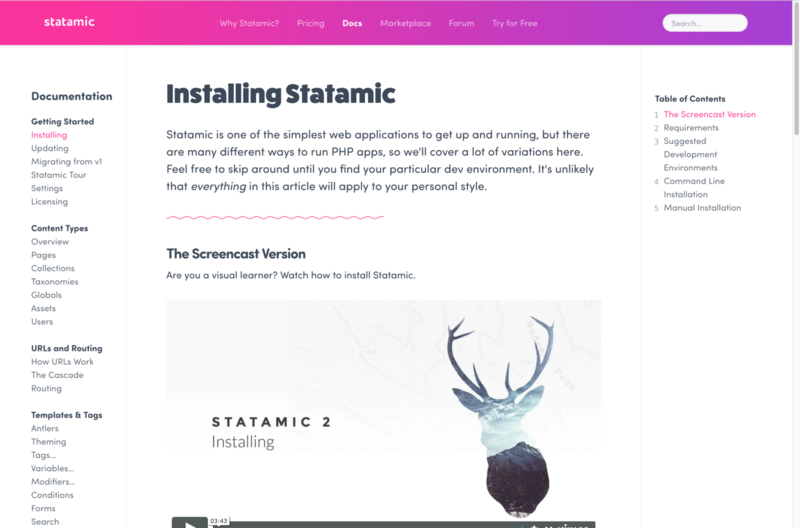 In this week’s article I’ll be taking a look at Statamic, another self-hosted CMS that claims to be an easier way to manage websites. Like Grav, Statamic ditches the database in favor of a strictly file-based architecture. This makes version control, development, and migrations a piece of cake. It’s also a relatively new CMS compared to WordPress, having been around since April 2012. But how does it stack up? Let’s take a look! Installing Statamic was incredibly easy. With no database needed, all you need to do is drag the Statamic files into the server web root, and rename the sample.htaccess file to .htaccess so that rewrites are working. Overall, I was extremely impressed with the install process. Not having to create or even think about a database was great, and the installer was both pleasant to look at and easy to use. Winner: Statamic. 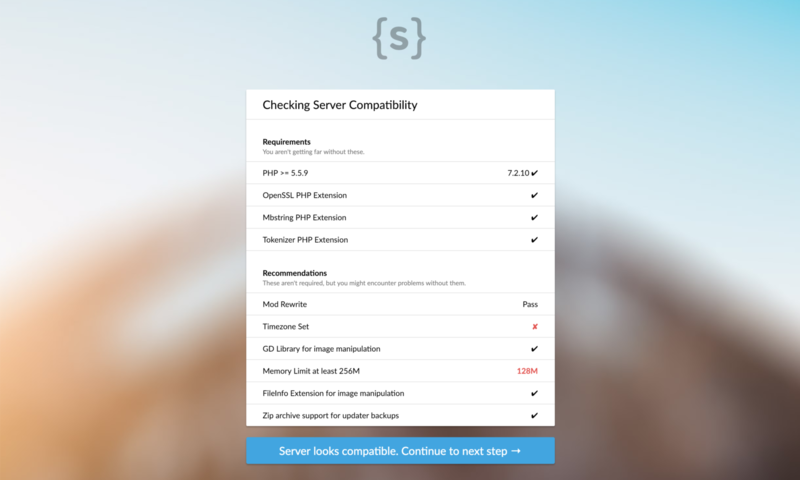 Statamic beats out WordPress here because it has probably the nicest installer I’ve ever seen, checks the server requirements for you, and is overall just really slick. All the standard functionality is there, with tabs for adding/editing pages, posting to the blog, and even a page for managing contact form responses (it has built-in forms by the way!). Editing pages or blog posts is a blast with built-in markdown support with syntax highlighting. We use Markdown to write all of our posts here at Delicious Brains, and I wish that our Markdown integration was as snazzy as this! Visiting the “Assets” tab brings up a full-fledged media library. It has built-in support for adding custom folders to organize your assets, something that WordPress is lacking. One thing that I liked is that it makes it super easy to customize the control panel login URL, or even disable it automatically for certain environments with use of a .env file. One thing that kind of irks me is that there’s no way to install themes or addons (more on those later) directly from within the control panel, but that may be a blessing to some. Winner: Tie. While I feel that WordPress might be easier for non-developers, it really is a pain for developers, and this is where Statamic shines. I don’t think I’ve seen another CMS that makes it as easy to set up and customize the back-end, which means you can spend less time setting things up and more time actually managing the site. Like some of the other CMS options I’ve reviewed, Statamic uses Laravel as a base framework, which means that it’s about as clean and future-proof as a CMS can get. It also includes a lot of functionality in core that is usually delegated to plugins in WordPress, such as support for custom fields, backups, contact forms, and more. In contrast, WordPress is in a bit of a funk at the moment and seems torn between improving the code base and user experience with things like Gutenberg, while at the same time trying to be backwards compatible. And can I mention that WordPress STILL supports PHP 5.2? Winner: Statamic, by a country mile. 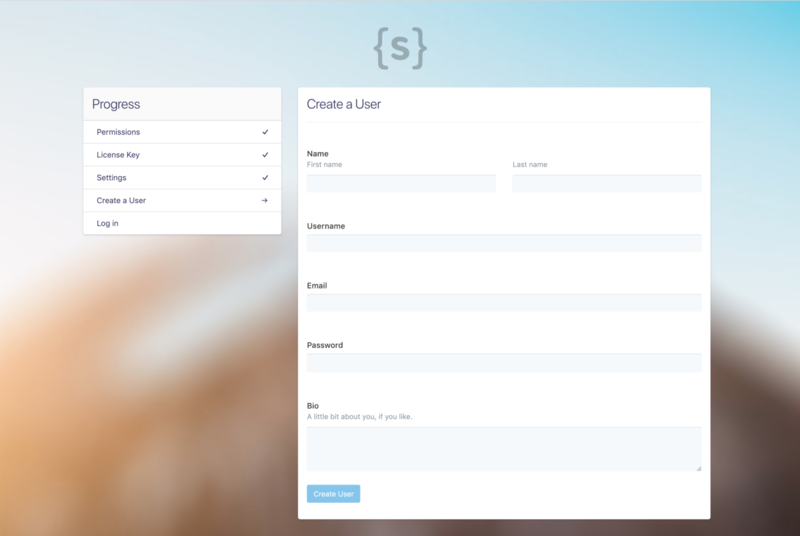 As with many other budding CMS’s, there aren’t a lot of themes to choose from with Statamic, and the emphasis is really on building your own theme at the moment. 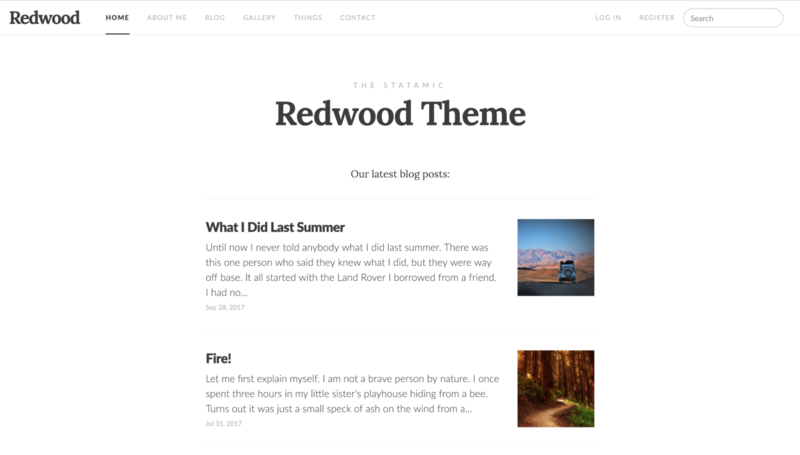 But I was pleasantly surprised that Statamic has a theme marketplace that allows you to peddle free and paid themes. It’s nice to see it getting off on the right foot, and hopefully that will encourage more theme developers to create themes as Statamic continues to grow. Winner: WordPress, but I think that Statamic is off to a great start. Statamic addons are the equivalent of WordPress plugins. Like themes, there isn’t a huge selection of addons yet compared to the over 50,000 plugins available on WordPress.org. This is likely due to a combination of Statamic having more functionality built in, and it being a relatively new CMS on the market. However I did see some promising addons including Akismet, SEO Pro, and MailChimp. I also liked the way that Statamic includes links to addons that live on GitHub but states that your mileage may vary. These addons aren’t officially in the Statamic marketplace, but are listed on the website as an easy way for addon developers to get their products out in the wild. Winner: Once again, WordPress wins by default, but given enough time and adoption I see no reason why Statamic couldn’t do just as well. Statamic is very flexible when it comes to creating custom fields and post types (called “Collections” in the Statamic world). 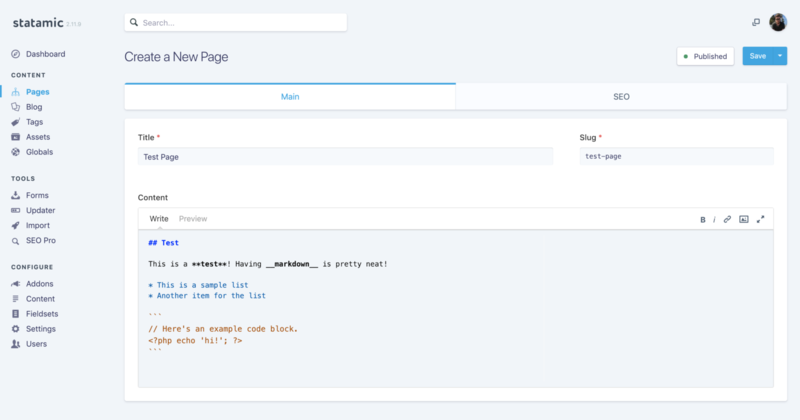 Collections can be created and managed via the control panel, without having to write a bunch of code. 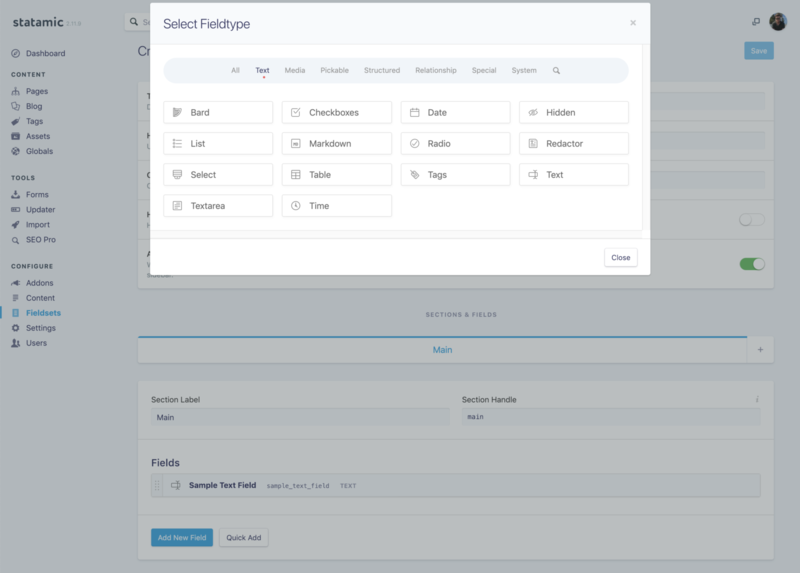 Once you create a field set, you can then assign it to be used by any collection, similar to how Advanced Custom Fields allows you to assign custom fields to a given post type. I was very impressed with this system and the amount of fields that it offered right out of the box. There are also addons in the marketplace that add new field sets if you need more. Winner: Statamic. While Advanced Custom Fields is an awesome solution for WordPress, it’s hard to beat built-in support. Gutenberg has taken the WordPress community by storm recently, offering a new way to create and edit WordPress pages or posts. By dragging and dropping Gutenberg “blocks”, you can create a page with all sorts of functionality without having to modify your theme or write a lot of HTML. Statamic takes a slightly different approach with the Bard editor. First and foremost, it’s a minimalistic text editor, similar to the editor used by Medium. It allows you to do all the things you’re used to doing – like formatting text and inserting images – but it also allows you to insert custom field types. Adding support for custom field types in a given collection (for example, blog posts) takes a bit of initial setup. First you have to define the field type in a YAML file that correlates to the collection, and then you have to add support for it in your theme template files. Compared to creating a Gutenberg block, which requires knowledge of React and PHP, that sounds like a breeze. Editing YAML is dead-simple to get the hang of, and the templating system makes it easy to incorporate custom field types into your theme. But even with that being the case, I felt that using Gutenberg was easier. It has a lot of blocks set up and ready to use right out of the box, and there’s already several plugins that can add more blocks without writing a single line of code. Winner: I can’t believe I’m saying this, but I prefer Gutenberg over Bard. While it’s harder to create custom Gutenberg blocks, the blocks that are there are dead simple to use. And with the plugin community being as strong as it is, I doubt the majority of users will ever have to even think about creating their own blocks. 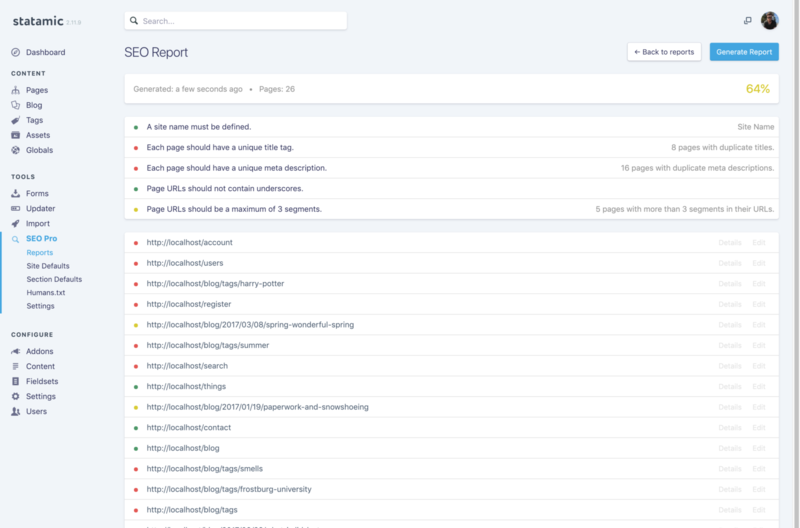 Statamic will have SEO-friendly permalinks right out of the box, but you can also install the popular SEO Pro plugin which adds additional functionality like detailed reporting, custom meta data, and Open Graph tags. I gave it a test drive and it seems on par with the Yoast SEO plugin we’re all so familiar with. Winner: Tie. Both platforms will give you all the tools you need to show up in search results. This is one area that I feel Statamic falls a bit short. There are a few eCommerce addons, like Charge and Statamify, but nothing in the way of a full-fledged, flexible eCommerce system like WooCommerce or Easy Digital Downloads. I’m sure with Statamic being written on Laravel, it’d be pretty easy to roll your own solution, but nothing beats installing a tried and tested plugin and being ready to sell all sorts of products within a few minutes. Winner: WordPress. I’m sure Statamic has a lot of potential, but WordPress has already realized that potential and has countless websites selling everything you can imagine. Statamic documentation seems to do a good job of organizing everything in a logical way, is well-written and easy to read, and even includes a few well-placed screencasts. Winner: Statamic. If I wasn’t sure about anything, I was able to find it in the documentation with ease. I also didn’t find anything especially lacking, like what can happen with some WordPress core functions. Statamic costs $199 per live domain. You can also purchase a Master License, which costs $895 and includes licenses for 5 live domains, and 25% off each additional license. These licenses might seem pricey to some, but should be easy enough for freelancers and agencies to recoup in the cost of building the website. As it’s a paid CMS, I wasn’t expecting to see it licensed as GPL like WordPress is, and indeed it has its own licensing terms that prohibit redistribution and resale. I do wish that it were open source. While it has a Github repo for feature requests and bug reports, it’s not the same as a fully-public codebase that everyone can review and contribute to. Winner: WordPress. While I don’t have a problem with paying for quality software, the $199 1 site license is a bit too steep for me to consider using on smaller websites or for personal use. And I’ve always been a huge fan of open-source. I really enjoyed taking Statamic out for a test drive. As always with these CMS reviews, taking a moment to see what else is out there helps to give perspective to what WordPress could work towards in the future. If I worked at an agency that pushes out a lot of sites, I think I’d prefer to work with Statamic over WordPress due to the newer codebase and the ease of use. But if I were just spinning up a personal site or side project, the high cost of Statamic would probably push me back to WordPress. Have you ever worked with Statamic before? If not, would you be willing to give it a try? Let us know in the comments. This entry was tagged WordPress alternatives, CMS, Statamic.